I took the afternoon of Remembrance Day (a non-binding holiday to respect our military veterans, which my company does not formally accommodate – never fear, I worked 5-8:30pm in the evening) to take advantage of spectacular autumn weather and sufficient motivation to attack Cypress Mountain for the second time. 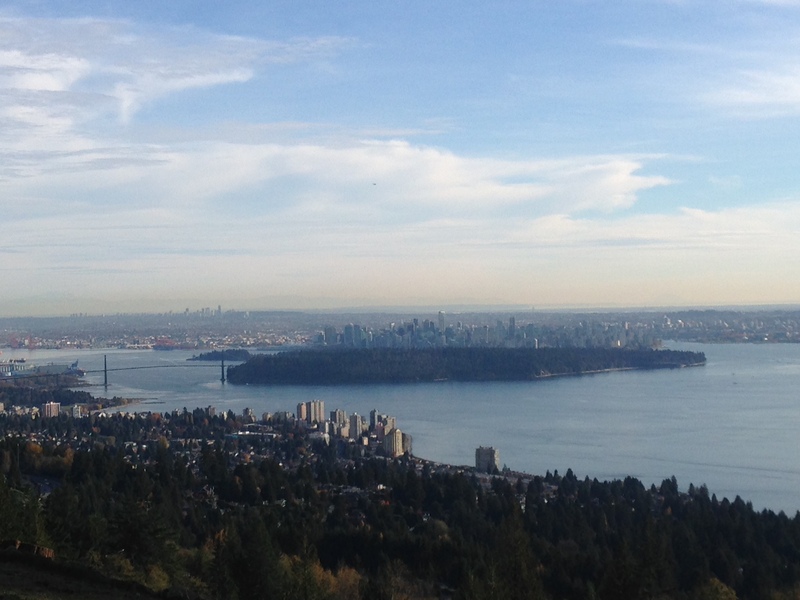 The photo of Vancouver (above) shows the southward view from about 1/6 of the way up, half way to the first look-out. What a day! Cypress is the western-most of the three North Shore mountains that border Vancouver’s northern perimeter. They are the urban geographical landmarks which mark the start of the Coastal Range which cover the Canadian coastline all the way up to Alaska. Cypress is a fair-to-middling semi-urban ski hill, whose runs are decent though few, whose snow is mediocre, but whose proximity to the city is celebrated. In warmer times of the year, including currently, the 12-kilometer, 700-meter gain switchback road up to the base and ski-hill parkade makes a thoroughly challenging climb for road cyclists. Indeed, hundreds if not thousands of cyclists take on the ascent every weekend in the summer. It is one of the “triple crown” climbs, which also includes Grouse Mountain and Mt. Seymour. Thankfully, this day I noted only a handful of other cyclists – all of whom were descending while I was on my way up. I passed a couple more who were climbing during my descent. I didn’t set any speed records on this day, rather I was motivated to get into rhythm and establish a cadence and heart rate that would sustain me without blowing up, and I think I succeeded. I settled into a 60-70 RPM ascent at about 170 BPM and averaged about 11 km/hr. It took me nearly an hour to make the climb (compared to about 5 minutes to descend, hitting a top speed of 78 km/hr). I maintained enough energy to get out of the saddle and “stretch the legs” from time to time which changed muscle groups and alleviated pressure in delicate areas – both necessary practices for surviving long periods in a seated position. I’d derived motivation from not only the fantastic day (average about 11-12 degrees C, calm, beautiful sunshine or high overcast) but also the guilt of having attended 3 consecutive “gala” style dinners. It’s my busiest season of work and part of being a wine importer means hosting big events with winery people from all over the world. The events usually involve a lot of wine, and thusly a lot of food. Thursday, Friday, Saturday were all multi-course meals at fancy restaurants with copious amounts of wine. All calories ripe for the burning! 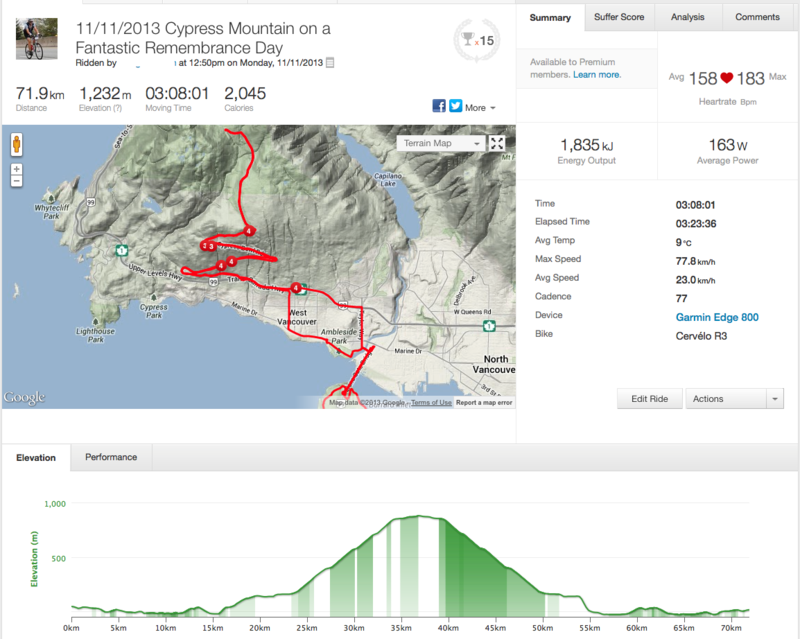 All told, I was very satisfied with my climb (second ever up Cypress) and look forward to tackling it again. Nice to know I’m still in respectable shape, too, being that I’m mostly on my trainer these days.